Dominic Tafoya and Dave Honaberger prepare a refurbished DARHT (Dual Axis Radiographic Hydrotest Facility) 2nd axis accelerator cell for magnetic axis alignment measurements. The weapons programs at Los Alamos have one principal mission: ensure the safety, security, and effectiveness of nuclear weapons in our nation’s enduring stockpile. One critical component of this mission is DARHT, the Dual-Axis Radiographic Hydrodynamic Test facility. DARHT consists of two large x-ray machines that produce freeze-frame radiographs (high-powered x-ray images) of materials that implode at speeds greater than 10,000 miles an hour. Such radiographs help scientists ensure that weapons in the stockpile are safe and effective and that—if ever necessary—they will perform as designed. Ten years ago, Los Alamos personnel brought DARHT’s first axis online. In December 2009, after surmounting technical challenges, DARHT achieved its first dual-axis, multiframe hydrodynamic test (hydrotest), following a preliminary test in November. In July 2010, DARHT completed a successful two-axis, multiframe hydrotest. 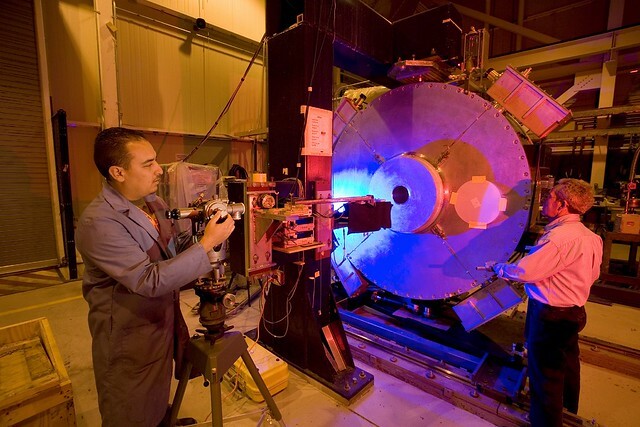 Two additional successful tests—one of which was designed by Lawrence Livermore National Laboratory—were performed in 2010. With DARHT fully operational and producing successful dual-axis hydrotests, scientists are now studying full-scale mockups of how nuclear primaries explode. During a hydrotest, scientists detonate a “mockup” of a pit, the primary stage of a nuclear weapons system. The mockup consists of actual high explosives and most other ingredients, except for plutonium. Instead of plutonium, scientists use a nonfissile substitute material that has similar, weight, density, and other metallurgical properties so that it behaves much like the plutonium. The one thing the mockup does not do is produce a nuclear explosion when detonated. With both beams operational, DARHT can take four sequential radiographs on one axis and one radiograph along a perpendicular axis, providing the first-ever simultaneous views of an implosion from two directions. The exposure time of such radiographs—60 billionths of a second—freezes the action of an imploding mockup to much less than a millimeter. To do this, DARHT orients the two linear-induction accelerators at right angles to one another. A linear-induction accelerator uses magnetic cores to enable better coupling of electrostatic fields, thus accelerating electrons or other particles to extremely high energies. At DARHT, such electron beams are focused on a metal target. As the high-energy electrons hit the target, the electrons are deflected, converting the beam's kinetic energy to powerful x-rays. Along with other tools, such as advanced laser interferometers and electronic position indicators, DARHT produces data sets during these hydrotests that are used to verify computer codes for nuclear weapons. The data sets of full-scale implosions are compared to simulations derived from the computer codes. The DARHT program has proposed to increase the rate of hydrotests. DARHT personnel also plan to improve its multi-image capability. Such improvement could potentially increase the number of radiographs possible with each test. The results of these studies will help improve and verify computer models, which in the absence of actual nuclear testing are critical in assessing the effects of aging and remanufactured nuclear weapons. DARHT and its data-rich radiographs supply real-world validation for the codes and thus effectively enhance the confidence and credibility of stewardship efforts designed to ensure the national security of the United States.